How A Grandmother Of 6 Built A Figure Athlete Body In 98 Days « Burn The Fat Blog – Tom Venuto. My name is Karen, I am 48 years young and yes, I have six grandchildren! I exercised on and off for most of my adult life; but during the past 5 years I struggled with ill health and various injuries and operations – including a trapped nerve in my neck that I was told I’d “just have to live with.” The constant pain led to a painful path of self-destruction. With no motivation or passion for exercise, I turned to junk food comfort eating, pain killers and hours of television per day. There were some days where I didn’t even bother to get dressed. The aches were non-stop, I was crying a lot, I felt old and worn out, and I slipped into a deep, deep depression. I had completely given up on exercise, eating healthy and on myself, until I ran across a few of Tom Venuto’s articles on Facebook. They just made sense to me! There was one in particular that caught my eye – it was about goal setting; and in it there was information about the 98-day Burn the Fat Feed the Muscle fitness challenge he sponsors every summer. It really was a make or break time for me. So I sat down on the floor, messaged Tom and told him that I had set my first goal, which was to enter the summer challenge. I couldn’t believe it; he actually wrote back and wished me well! That article and his kind reply helped me to not only believe in myself again, but it gave me the confidence to truly believe I could get back into shape and become healthier and happier again, and more importantly, stay that way! Entering the Burn the Fat, Feed the Muscle summer transformation challenge has been one of the best decisions I have ever made in my life. I can hardly believe how much I have changed both mentally and physically in just 98 days. I look nothing like my before photos. I will never look like or be like that person ever again. In fact, I can’t stop looking at my own journal because I am amazed at how much I progressed from start to finish. I put everything I had and more into this challenge. I couldn’t have worked any harder. I told myself at the start I can only do my best, and that’s what I kept telling myself, over and over. At the start, I was embarrassed to take pictures and start a journal because I thought, “What will people think of me?” I was completely out of my comfort zone. But I will say that making that initial post – with the before photos – helped me to commit to the entire program. Once I did that, I promised myself I would not quit, even if the going got tough. Failure was not an option! This was my first body transformation competition and I had no idea what I was getting myself into. I thought you posted a few photos, ate healthy, exercised a bit, take three “after” photos in 98 days and hope for the best. Ha! Jumping in head first was enough to make my head spin. There was so much to learn. Goal setting, macro calculations, meal preparation, workout planning, and more. All this while still trying to climb out of my black hole. I had a lot of catching up to do and it was now very clear to me that I had to take this seriously or my after photo would be the same as my before photo! I knew I had to get my head around wrapped around the mental training part of the program and get my mindset in order first. After that, I was better equipped to concentrate on nutrition. Both of those had to be in place before training even started. I began by cutting out distractions. I cut out all forms of social media and watched very little television. I set a strict bedtime for myself and stuck to it. Something I still do now that the challenge is over. I wrote affirmations and quotes in a book and read them every day. I used visualization techniques where I would imagine myself with the results I wanted to achieve and used my inner voice to help me focus on my goals especially as I was driving to the gym. I also put a countdown calendar on my fridge so it would be the first thing I would see each morning when I went for my coffee. I would cross off the day and I’d see the message I wrote on top: EVERY DAY COUNTS! This worked like a charm! As I mentioned above, because I was new to all this, I listened to audio interviews in the Burn the Fat Inner Circle member’s area and read lots of articles, including the success stories of prior winners to pick up a few pointers. After I officially set my goals, I worked out my calories and macros and only ate what was on the (Burn the Fat, Feed the Muscle) recommended food list. I weighed and measured all my food and drinks. I cut out all processed foods and chose not to have any junk food rewards at any time during the challenge. Amazingly, I did not feel hungry or deprived at all and once I started to enjoy healthy nutritious foods again, I stopped craving junk foods altogether. At the start, my training consisted of more cardio than weights because I was focused on burning fat. I didn’t go to a gym, I used free weights at home and I danced a lot. Eventually, I did join a gym so I could use some other equipment and also to have a place to train when the UK weather didn’t cooperate (which it seldom did). I did hill sprints for a while and even exercised on a field with my soccer ball or in a park. I felt myself getting stronger and fitter day-by-day and pushed myself a little bit more each time I trained. In the final stretch of the challenge I focused a lot more on weights and less on cardio. I never lifted extremely heavy – because I didn’t want to re-injure my neck – I concentrated on slow, strict form in everything I did. One thing I would say to someone new to the Burn the Fat community is not to compare yourself to anyone else. As Tom mentions in the contest rules, winners will be judged based on the THEIR OWN improvement in body composition. That’s what makes this challenge unique and friendly. You’re not actually competing against others, you’re competing against yourself – to become a better, leaner version of the former you. So my biggest piece of advice is, just aim to be the best that YOU can be! Don’t fall into the “comparing yourself to others trap.” Compare yourself to your before picture and visualize yourself taking an amazing “after” picture. I also wanted to add this: I am living proof that an average person – even a granny like me – can get in shape if they put the work in and stop doing all those silly advertised diets! I did this by myself. No trainer. No coach. I had no real qualifications to do it and no real expert knowledge before entering the challenge. The only help I received was from Tom’s books, his articles and the people at the Burn the Fat Inner Circle. I think I did a good job considering it was just 98 days. And now that I have the basics down pat, I know I will be in the best shape of my life by the time I hit the big 50! One of my goals was to get back into my skinny jeans. And I did! And I am extremely happy with how I look now. I am so happy and proud of myself that I completed this challenge and would like to thank the people in the inner circle for their words of encouragement on my journal, and a special thank you to Tom Venuto and also to the challenge coordinator, Katherine, for all their support. 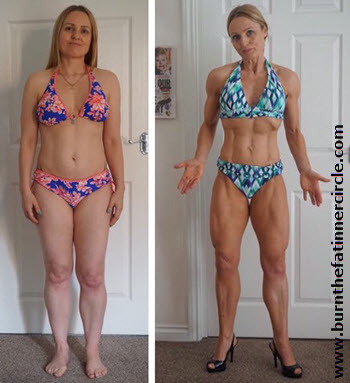 CLICK HERE for the Burn the Fat Challenge – Enter the challenge (it’s free) and you could be the next transformation success story! Why Do Most People Gain The Fat Back?